Even though the negative health effects of xylene have been known for more than 60 years, some labs continue to use this solvent when alternatives exist. Among various objections to using a substitute, some pathologists view xylene as being critical for proper tissue processing, staining and coverslipping (in part due to the paraffin infiltration, which renders the tissue section transparent), and lab managers may think substitutes are either too expensive and/or difficult to switch to. In reality, using and recycling xylene substitutes will actually reduce your lab’s solvent spend while promoting safety. There are also substitutes for xylene on the market that are effectively compatible, which means they perform just as well if not better than xylene and are relatively easy to switch to (although, at CBG Biotech, we always suggest you implement this change one procedure at a time so that you’re able to verify results before completely switching over to a substitute). Is Using Xylene Potentially Hazardous? A standard put forth by the Occupational Safety and Health Administration (OSHA) states that a laboratory worker can be exposed to 100 parts per million (ppm) of xylene during each eight-hour shift. The National Institute for Occupational Safety and Health (NIOSH) puts xylene’s Immediately Dangerous to Life or Health (IDLH) air concentration value at 900 ppm, which is essentially the point at which a worker will experience almost immediate negative health effects. *Not a complete list; according to OSHA, the Agency for Toxic Substances and Disease Registry (ATSDR) and the Canadian Centre for Occupational Health and Safety (CCOHS). Twenty of the 30 substitutes for xylene on the market today are safer than using xylene itself. However, they vary greatly in efficacy. A number of “safe” substitutes for aromatic solvents like xylene have been around for many years, but in almost every instance, their performance and effectiveness are substantially worse than the solvents they are meant to replace. In the early 1990s, there was a breakthrough. Research conducted by CBG Founder and Chairman, Gerald W. Camiener, Ph.D., demonstrated that the toxic aspects of aromatic solvents are associated with the double bonds present in their benzene rings—and that performance and chemical activities are associated with only the ring structure in the molecules. This research led to the development of naphthenic solvents that are similar in performance. Chemically, these newer, safer solvents are naphthenic hydrocarbons. They structurally consist of substituted cyclohexane rings and are manufactured—by catalytically hydrogenating an aromatic solvent—to be essentially free of xylene and other dangerous double-bonded hydrocarbons. Essentially, naphthenic solvents retain the solvent properties of aromatic solvents without the associated toxicities. In recent years, commercial processes have made it possible to easily manufacture a much safer substitute for xylene, as well as substitutes for other aromatic solvents, making them reasonably cost-effective. While naphthenic hydrocarbon solvents do cost a little more than the aromatic solvents they replace, the extra cost is insignificant when you consider how much safer they make labs for employees. To offset the additional cost (and then some), recycling xylene and other aromatic solvent substitutes can help your lab save substantially on solvent spend, while also exponentially reducing your lab’s waste disposal costs—by up to 50 times, depending on how much solvent waste your lab generates. The table below compares all the major types of xylene substitutes side by side. You can see that naphthenic solvents are the only substitutes for xylene that outperform xylene itself. Figures in the table less than 1.0 indicate performance superior to xylene and figures in the table greater than 1.0 indicate performance inferior to xylene. 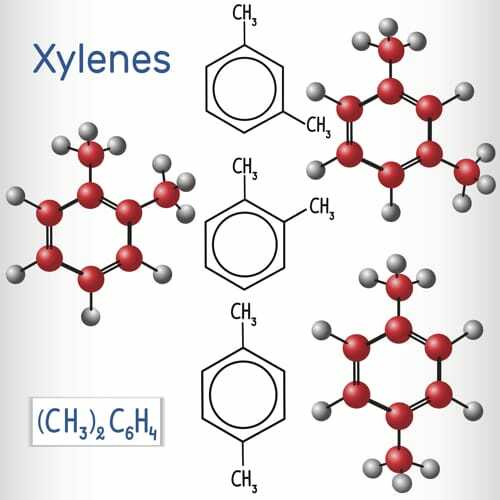 For reference, below are the types of xylene substitutes by their common brand names. Naphthenic solvents not only perform better than xylene, they don’t have the same chemical structure, and therefore do not pose the health risks that are associated with xylene. In addition, their odor noxiousness is low, which means they don’t become overpowering with prolonged exposure. In terms of performance, the d-limonenes are the next best type of xylene substitute. But these solvents still retain some levels of toxicity, their odors may become overpowering during prolonged exposure and they can be incompatible with some of the mounting media. D-limonene solvents also dry very slowly compared to xylene and they often leave an oily residue. The poorest-performing substitutes for xylene are the paraffinic and isoparaffinic hydrocarbons and the mixtures of paraffinic hydrocarbons with glycol ethers. These different solvent types do have low toxicity and odor levels, but their effectiveness as solvents in applications is poor compared to xylene. Naphthenic solvents are clearly the best choices for replacing xylene and other aromatic solvents. When combined with solvent recycling, they can help ensure your lab is both safe and running cost-effectively. Today, histology, pathology, cytology, research, veterinary, parasitology and dermatopathology labs should work to provide a safe environment for personnel by helping them avoid the toxic and dangerous effects of xylene. There are many safer options available. But only one option is as good as or better than xylene itself. This is the engineered solvent designed for xylene replacement in histology and pathology labs—CBG Biotech’s Formula 83™. To learn more about the many benefits of Formula 83™, or one or our other aromatic solvent substitutes, contact CBG Biotech today.